OK, so… there might be a little bit of exaggeration in this title, but not much! Let’s get to it! First off, we’ll be ringing in the New Year with the year’s first Supermoon, on New Year’s Day! It’s bigger, it’s brighter! Because it’s closer… the full Moon just happen to occur within a day or two of the lunar perigee, its point of closest approach to Earth. And really, the Moon’s apparent size IS a little bigger, though not so much that you’d notice unless you’re REALLY tuned in to the Moon. Perigee happens every month, but that doesn’t always coincide with a full Moon. When it does happen, the resulting supermoons tend to cluster for a few months until we move around the Sun and force a shift in the position of the full Moon. So…we had a supermoon last month, and now this one… and because we are seeing one full Moon on the 1st, we are going to have another full Moon, which will also be Super, at the end of January… and it will also be eclipsed! So yes, in a few weeks, the Full, Blue, Blood, Super Moon! Wow… get your anti-werewolf kits ready. 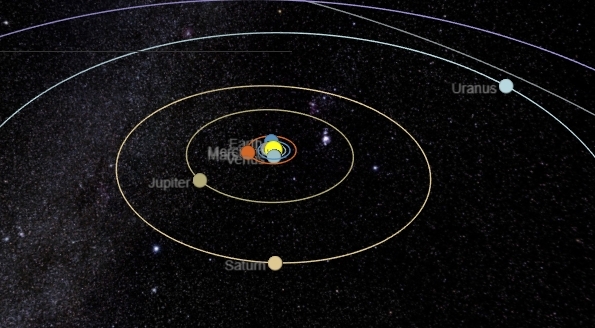 The very next day, Tuesday Jan 2, we have another close approach – Perihelion. This marks the point in Earth’s orbit that we pass closest to the Sun. It’s also the point in our orbit where Earth is moving the fastest (hold on), which means we’re zipping past the Sun while our rotation is about the same – so if you start a clock at noon (directly under the Sun….. NOW) and then stop it at noon on Wednesday, you’ll notice our solar day is longer than average – by about 7 seconds. This is because as we fly past the Sun on our orbit, a given point on Earth will actually have to turn a little farther than usual to point back at the Sun. This week we will also have a fairly prolific meteor shower, the Quadrantids. This is a fairly dense shower, with up to 120 meteors per hour. However, its peak is a brief window (overnight Wed-Thurs, Jan 3-4), and that happens to correspond to a fairly big, bright, just-past-full waning gibbous Moon. So most of the meteors are likely to be lost in the glare. Finally, get up before dawn this week. I don’t advocate that much, but this week, seriously. Do it – for three planetary reasons. Mercury – this tiny little speedster is close to the Sun, obviously, and so from our perspective never gets very far from the solar glare. This week – in the mornings – Mercury passes through its farthest point of elongation from the Sun, and since it’s running essentially directly away from us, its motion will appear to slow, stop, and reverse direction, giving us several days where Mercury sits almost stationary with respect to the Sun, and easily visible (surprisingly bright) about an hour before dawn. It’s hanging out just left (south) of the bright star Antares in the neck of Scorpius. In this 12/30/17 view of the solar system, Earth is the blue inner planet at the top – notice Venus and Saturn essentially opposite the Sun, Mars and Jupiter in alignment in the morning sky, and only Uranus visible at night. Notice Orion in the night sky (opposite the sun) as well. Mars and Jupiter – I’m listing them together, because this week, they will be. Both are slower than us, but we’re catching up and running between them and the Sun, which pushes them (again, from our perspective) farther and farther to the west, and higher in the dawn sky. Because it’s farther out, and its angular velocity is slower than us, our overtake on Jupiter is more rapid than on Mars. The effect – Mars is not moving much, but Jupiter is getting visibly higher every day. On the morning of the 6th (Saturday), Jupiter will be right next to Mars, a tad lower. They are so close that you can see BOTH, at the same time, in the view of a medium-powered telescope. 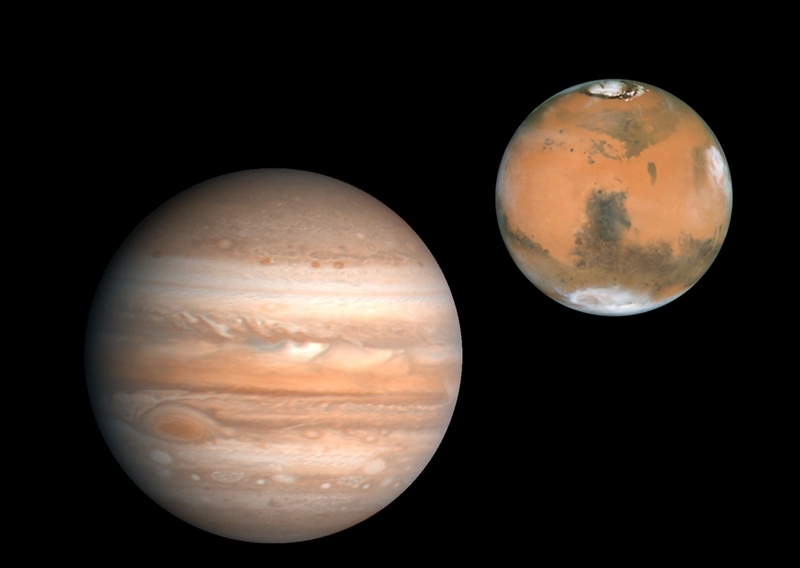 The next morning (Sunday the 7th), they will be about the same distance apart, but Jupiter will now be above Mars. After this point, Jupiter will continue to move higher in the sky and will widen the gap. After this, you can bid farewell to Jupiter – it will be up and visible at a reasonable evening hour soon enough. Venus – you can’t see… it’s actually running behind the Sun. I point it out because while we’re visualizing planets running past each other, consider that Venus – with an orbit inside ours – is running AWAY, and moving LOWER in the sky. It will pass behind the Sun and appear in the evening sky in a few months (about mid-May), coming from the west about the same time Jupiter re-enters the evening sky from the east. Pretty neat, eh? Happy 2018, and happy sky viewing! I didn’t realize that the solar day was going to be slightly longer. That’s an interesting little thing to know.